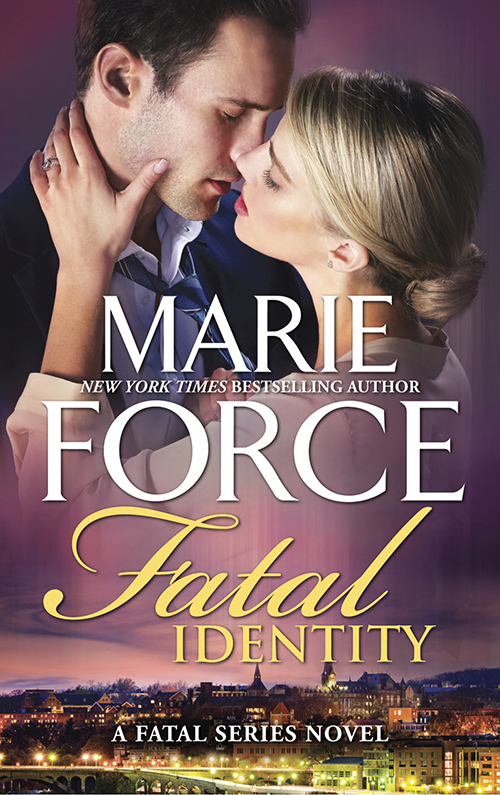 Just Romantic Suspense: Sam & Nick are BACK in Fatal Identity! Sam & Nick are BACK in Fatal Identity! Congratulations to "Mary C.", the winner in Marie's giveaway. Thank you to all who participated! Readers have been counting down to the return of their favorite Washington, D.C. power couple, Metro Police Department Lieutenant Sam Holland and her husband, Vice President of the United States, Nick Cappuano, and the book is finally here! Fatal Identity is the tenth full-length novel in the Fatal Series and a milestone moment for the series that began as digital-only. With Fatal Identity, the series is now available in all formats simultaneously—ebook, print and audio, which readers have been wanting for a while now! In this tenth book, Sam is staring down a suspension after she punched a fellow officer at the end of book 9, Fatal Frenzy. Sam being Sam, a little thing like a suspension isn’t going to keep her sidelined for long, especially when a new case drops into her lap. A young man has seen an age-progression photo of a child kidnapped thirty years ago, and the image is a dead ringer for HIM. He comes to Sam, who has gained national prominence after arresting a killer in the middle of her husband’s inaugural parade, because he trusts her to help him get to the truth. Her suspension comes at a difficult time for her squad, which is mourning the loss of one of their own while her second in command, Sgt. Tommy Gonzales, is mired in grief after the loss of his partner. I had so much fun writing this new Fatal book. Going back to Sam and Nick is like visiting old friends after writing them for nearly eight years now. I can’t imagine life without them! Sam has a LOT on her plate in this new book, especially when Nick and their son, Scotty, are felled with the flu. Life is always crazy and unpredictable for the Cappuanos, and that is certainly true in Fatal Identity after a high-profile government official is murdered and she’s left to wonder if the man who dragged her into this case has been playing her all along. Pesky FBI Agent Avery Hill is back in this edition, and when Sam decides to accompany Avery on an overnight trip during the investigation, her husband has a few choice words for her about that! Readers ask me all the time how long I plan to write the Fatal Series, and I always have the same answer—as long as they continue to love the books as much as I love to write them, the series will continue. The next book, Fatal Threat, will be out in 2017, and I can’t wait to get back to writing more Sam and Nick! Hope you all enjoy Fatal Identity! GIVEAWAY: Enter to win a copy of book #1 in the series, Fatal Affair! Respond to this question in the comments section: Besides Nick & Sam, who else are your favorite romantic suspense duo’s? About the author: Marie Force is the New York Times, USA TODAY and Wall Street Journal bestselling author of more than 40 contemporary romances, including the Fatal series. Sixteen of her books have been New York Times bestsellers and she recently recorded her 5 millionth career sale. Find out more about Marie and her books at MarieForce.com. Giveaway ends 11:59pm EST Aug. 6th. Please supply your email in the post. You may use spaces or full text for security. (ex. jsmith at gmail dot com) If you do not wish to supply your email, or have trouble posting, please email maureen@justromanticsuspense.com with a subject title of JRS GIVEAWAY to be entered in the current giveaway. I love JD Robb's Eve and Roarke. Their relationship is so fun to watch develop over the series. Not entering the giveaway but just want to say this is a wonderful series! Love Nick & Sam. They do remind me at times of Eve &Roarke. I can't say that I have an absolute favorite. Dallas and Roarke from J.D. Robb's In Death series.